Fusarium oxysporum is associated with vascular wilt disease in most of the crops. Identification of Fusarium spp. by morphological characters are highly variable, thus DNA-based techniques such as RAPD and SSR markers are widely used in the detection and genetic diversity analysis. In this study, fifty F. oxysporum f. sp. 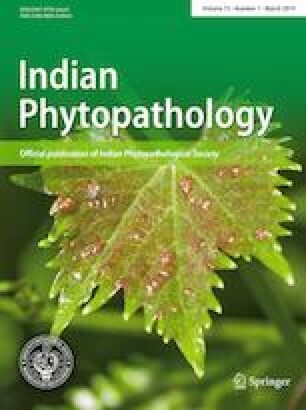 lentis (Fol) isolates from 7 different lentil cultivating Indian states were analyzed for the genetic diversity by using 14 RAPD and 9 SSR primers. Results revealed the existence of high genetic variability among the isolates. A total of 125 reproducible bands were amplified by RAPD primers, out of which 121 were polymorphic (96.8%) and only four were monomorphic (3.2%). Primers OPA 12, OPC 14, OPF 8, OPM 12 and OPY 20 showed the highest polymorphism. UPGMA analysis differentiated the isolates into six clusters at 25% similarity coefficient. Nine SSR primers produced 59 bands with 96.6% polymorphism. The primers MB 2, MB 9 and MB 11 were highly informative and showed maximum polymorphism (100%). UPGMA analysis at 30% genetic similarity grouped the isolates into six clusters. It was evident that the isolates belonging to different locations were grouped into different clusters representing different races. However, the analysis partially corresponded to the races of Fol and the lentil growing regions of India. Nevertheless, this information is highly useful for the breeders to plan the breeding strategies to develop resistant cultivars against Fol looking into existence of races in a particular region and considering the diversity among them. The authors are thankful to Dr R. G. Chaudhary, IIPR, Kanpur and Dr D. R. Saxena, RAK College, Sehore, for providing the Fol cultures. The author (first) is also thankful to IARI, New Delhi and UGC, New Delhi for providing Rajiv Gandhi National Fellowship.